Hey everyone! 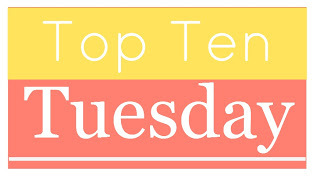 I'm back with yet another Top Ten Tuesday list- courtesy of brokeandbookish.blogspot.com. This week, the list is about the Top Ten Things that Will Instantly Make Me want to Read a Book! NOTE: None of these items are all-consuming. They are either background elements or share the limelight with some other concept in the novel. I have a weakness for books set during WWII (I'm a huge history fan). Since personal feelings are rarely explored within the walls of a history classroom, I seek books that incorporate great writing and history into a work of fiction. Recommendation: All the Light We Cannot See by Anthony Doerr. Whether it's a social experiment, a new hobby or a family adventure, I usually love reading stories about new experiences! Don't get me wrong- I don't mean books that advise you on where to travel. I mean books where travel is a main theme and plays into all that is important about the characters. I really like travel-journalism books as well. If the book is about a talented young artist I will immediately want to know more! Whether they're musical proteges, artistically inclined or graceful dancers, there's ALWAYS more to the story! Whether or not the hobby is the main focus of the story, it usually adds essential elements to the narrative and the character. My favourite type of High-School books are always the ones where an unlikely friendship springs up. Where opposites attract and it forms a dramatic relationship! Where the main character is an orphan, or has either abandoned or been abandoned by her family. (Literally or figuratively). I really enjoy the development of the characters as they learn to trust others and get over the tragedies they have suffered. We all say we don't judge a book by its cover, but who are we kidding? I'm going to stop the list here, because most of the other things I have in mind are conditional... what topics would make your list? Leave me a link and I'll go check it out! Exactly- WWII books can get boring, but when they talk about a young nurse, or a waiting wife, or an aged soldier they become the best books ever! I'm an armchair adventures gal too! I think it's the same situation with all travel readers! Either that, or excess travel has led to an addiction! Brilliant list! :-) I agree with all of these points! I completely forgot about WWII on my list! What are some of your favorite books set during that time? I also love books involving travel. It's fun to see a new place without spending any money, haha. I loved All the Light We Cannot See, and I also really enjoyed Rose Under Fire. Annexed was definitely interesting as well! I am definitely guilty of judging a books by it's cover. lol! I can't help myself. I blame the artsy side of myself for that. I completely forgot to put artistic/hobby related on my list. I really love those types. Great list! Thanks Julie! I think all of us forgot some element or the other on our list- I didn't even make it to ten! Definitely enjoy WWII books. And books with pretty covers too. Great covers and high school are nice. Travel too- I'd like to read more travel related stories. I have a label on my blog for travel. It includes some book reviews and some pictures. I'm sure you can find something there! I love reading books with travel, high school and fitting in and also about a character who is artistic or has a hobby. The best book would include all of those topics rolled into one :D.
I can't wait to find a book that involves all of them! This Adventure Ends by Emma Mills comes pretty close- it involves short road trips! What a great list... I didn't think sbout 2, 4 or 6! I love reading about orphans...how did I forget that?! And I'm all for trying new things and artistic stories... All the slight We cannot See is what I was trying to think of in my reply to your comment! That was pretty good, right!? It was amazing! I absolutely loved it! Great list, I don't know why, I don't go looking for WW11 books but I seem to read a lot of them. I loved Kristin Hannah's Night Road by the way, listened on audio to it quite a ways back. I don't go looking for them either! They find me.... a lot of my friends know I'm a history fan so they recommend them to me. I love reading about travel or try new hobbies I wish I could pick up, it makes me wish I had an endless bank account! I also love me some pretty covers! Well you don't need to have an endless bank account- that's why we all live vicariously through books! I look forward to hearing more about your WIP!! !